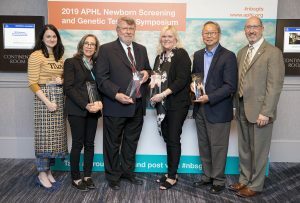 At the 2019 Newborn Screening and Genetic Testing Symposium in early April, APHL presented awards to leaders in the field of newborn screening. We commend the exceptional and innovative work of all those who were nominated. George Cunningham Visionary Award in Newborn Screening – This year’s recipient was Ming Chan, PhD, retired director of the Florida Bureau of Public Health Laboratories (BPHL). early adoption of SCID testing after its addition to the recommended uniform screening panel. In 2008, he retired as the director of Florida’s BPHL but returned to newborn screening as a consultant to continue ensuring healthy outcomes for infants through early disease detection. Harry Hannon Laboratory Improvement Award in Newborn Screening – This year’s recipient was Victor Skrinska, PhD, DABCC. Dr. Skrinska is the Head of Section for the metabolic laboratory and the National Newborn Screening Laboratory in Doha, Qatar since 2009. Dr. Skrinska’s research and method development of homocystinuria screening by way of measuring total homocysteine in dried blood spots using LC-MS/MS increased the accuracy of screening, resulting in timely identification and reporting of cases. He has also spearheaded the expansion of conditions screened in Qatar to include alpha and beta thalassemias, as well as expansion to other newborn screening conditions through the use of second tier screening methods. He has championed quality improvement in the laboratory and has been able to make these achievements independent of any political crises and embargos on his country. Judi Tuerck Follow Up and Education Award – APHL honored the efforts of two individuals this year: Barbara Ferreira, BSN, Area Service Center Director at Harbor-UCLA in California and Amy Gaviglio, MS, CGC, short-term follow-up supervisor for the Minnesota newborn screening program. Ms. Ferreira has overseen the screening of more than 20 million babies during her 40 year tenure with the state of California. She has improved and influenced the quality of newborn screening follow-up both nationally and within her state. Her experience has advanced the quality of newborn screening at the national level through her active participation on the Education and Training workgroup of the Advisory Committee on Heritable Disorders in Newborns and Children (ACHDNC) and the document development committee of the Clinical Laboratory Standards Institute (CLSI). Through participation in APHL’s Collaborative Improvement and Innovation Network and NewSTEPs 360 projects, she implemented measures to improve the timeliness of newborn screening in California. Amy Gaviglio has been working in newborn screening follow-up in Minnesota for the past 12 years and has been the short-term follow-up supervisor for 10 of those years. She has been intimately involved in Minnesota’s implementation of new disorders, both for screening and for improving the communication of newborn screening results. Ms. Gaviglio has also been a leader in facilitating the initiation and maintenance of screening efforts for critical congenital heart disease in MN, and used this experience to facilitate screening in other states seeking to do the same. She has been instrumental in promoting training for implementation of DNA-based techniques in screening and her expertise has been widely acknowledged through her professional activities at the national level, which include her Vice Chair position for the CLSI Expert Panel on Newborn Screening, membership on the American College of Medical Genetics and Genomics ACT sheet workgroup, and membership on ACHDNC’s Education and Training workgroup, as well as numerous APHL committees and workgroups. Everyday Life Saver Award – For the inaugural presentation of this award, APHL recognized the work and accomplishments of Krystal Baumert, follow-up coordinator for the Nebraska newborn screening program. Ms. Baumert has been working in newborn screening follow-up for over 25 years. Ms. Baumert was involved in the development of one of the first electronic match systems in the country to be able to accurately account for every newborn’s results, and she continues to work with PerkinElmer (Nebraska’s contracted newborn screening laboratory) to develop clear, effective daily reports for monitoring, tracking and follow-up so that none of the babies in Nebraska are lost to follow-up. This program was supported by Cooperative Agreement # 5NU60OE000103 from the Centers for Disease Control and Prevention. Its contents are solely the responsibility of the authors and do not necessarily represent the official views of CDC or the Department of Health and Human Services. The post Congratulations to 2019 APHL newborn screening award winners appeared first on APHL Lab Blog. The process for developing and deploying emergency diagnostics to laboratories nationwide will now be more efficient. 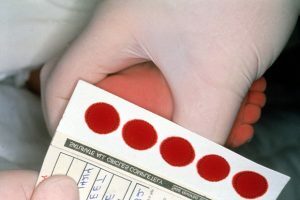 A new entity, the Tri-Agency Task Force for Emergency Diagnostics, has brought together representatives from the Centers for Disease Control and Prevention (CDC), the Federal Drug Administration (FDA) and the Centers for Medicare and Medicaid Services (CMS) to coordinate systems for rapid delivery of tests, reagents and guidance to public health and clinical laboratories. APHL contributed to the development of the Task Force by communicating the potential value of such a mechanism. Beginning in the early months of the 2016 Zika pandemic and continuing long after, the association and its member laboratories engaged federal partners in a dialog around systems for cross-agency coordination of emergency diagnostics. Kelly Wroblewski, APHL’s infectious disease director, adds that the Task Force makes communication more routine. “Having communication channels already open will make it easier to get the response going as quickly and efficiently as possible,” she says. Since 2016, the threat of Zika has subsided. In 2017 and 2018, there wasn’t another outbreak, but Zika will likely come back. But this time, the public health community will be ready. The post APHL: Engaging for change in emergency diagnostics appeared first on APHL Lab Blog. For over 50 years, newborn screening programs across the United States have implemented laboratory screening and follow-up programs to detect and report infants at high risk for rare diseases. As we look towards the future, current testing challenges will likely become more pronounced with the anticipated addition of new conditions to the Recommended Uniform Screening Panel (RUSP), increasing sophistication of testing platforms and methodologies, and greater complexity of biomarker profiles. Building the data analytic capacity of newborn screening programs will help support the analysis and interpretation of patient data, providing tools and resources to create efficiencies in time-intensive program activities. In March 2019, APHL and CDC hosted a national meeting in Atlanta, GA to broaden their efforts, engage state newborn screening programs in a collective data analytics initiative, and discuss progress toward enhanced disease detection utilizing improved data analytics resources and technologies specific to newborn screening. The meeting provided a forum for participants to discuss the needs around biochemical and molecular screening methodologies and their related data analytics requirements, as well as the value of data to improving health outcomes. This national dialogue will help guide CDC development of an in-house data analytics resource that will improve the interpretation of biochemical and molecular test results. This activity was supported by Cooperative Agreement #NU60OE000103-04 funded by the Centers for Disease Control and Prevention. Its contents are solely the responsibility of the authors and do not necessarily represent the official views of CDC or the Department of Health and Human Services. The post Enhancing detection of newborn screening conditions via data analytics appeared first on APHL Lab Blog. 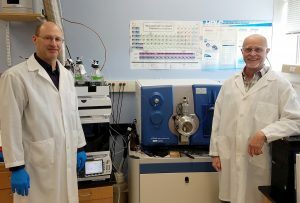 When an outbreak of contaminated synthetic cannabinoids reached Wisconsin in 2018, scientists at the Wisconsin State Laboratory of Hygiene (WSLH) rushed to develop the first quantitative method for diagnostic testing of brodifacoum, a powerful anticoagulant used in rat poison. Thanks to their work, patients with brodifacoum poisoning can now be treated with a precisely calibrated dose of vitamin K and that treatment can be ended when it is no longer medically necessary. Previously, physicians had to guess when to end treatment and re-start it if they guessed wrong. WSLH’s Noel Stanton, Chemical Emergency Response Coordinator, and Bill Krick, an Advanced Chemist in the Chemical Emergency Response Unit, speak with Public Affairs Director Jan Klawitter about the test’s development and the outbreak that made it necessary. The post Lab Culture Extra: How the Wisconsin state lab developed a test for brodifacoum and why it matters appeared first on APHL Lab Blog. Are antibiotics making printers great…again? Let’s be honest: printers have never been that great. These frustrating devices turn what should be a simple office task into a game of chance. Is there paper? Did it jam? Can I get by without replacing the toner cartridge… again? Ugh! I personally cannot wait until this archaic technology sails off into the sunset. Goodbye frustration and hello forestation. You can imagine my surprise when I heard a PRINTER could help fight one of the most significant public health threats of our time: antibiotic resistance. That’s right. The end of the antibiotic era looms, but hope lies with a printer! To be fair, this is not your ordinary printer that puts ink to paper. This is a bioprinter that “prints” antibiotics! The technology ultimately helps clinicians decide which antibiotic is most likely to be effective in treating an infection. Prescribing the proper antibiotic is key to saving lives today and preserving antibiotics for tomorrow. More specifically, the bioprinter makes antibiotic panels for broth microdilution susceptibility testing, a gold-standard method in clinical and public health microbiology. To make an antibiotic panel, the bioprinter dispenses minuscule amounts of antibiotics into a 96-well plate containing liquid that supports microbial growth. Microbiologists can then add a patient’s microbe to the plate and observe which antibiotic (or combination of antibiotics) inhibits growth. If an antibiotic inhibits growth on the plate, chances are good that it will also inhibit growth in the person. Results are shared with clinicians so they can prescribe the best antibiotic(s) to treat the infection. What makes the bioprinter unique is that it can easily make antibiotic plates with complex antibiotic combinations and new-to-market antibiotics. The latter is especially exciting given it can take years before new-to-market antibiotics are included on commercially available plates and systems found in most hospital laboratories. In 2018, the Centers for Disease Control and Prevention announced a pilot program to implement the bioprinter technology in the Antibiotic Resistance Laboratory Network, a consortium of 56 public health laboratories that aims to rapidly detect and respond to antibiotic resistance. 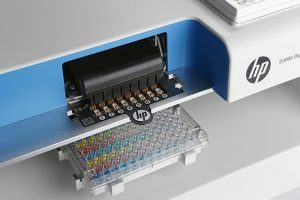 The pilot program already uses the bioprinter to offer expanded antibiotic susceptibility testing for hard-to-treat infections in four public health laboratories: Wisconsin State Laboratory of Hygiene, Minnesota Department of Health Public Health Laboratory, Wadsworth Center Laboratories and Tennessee State Public Health Laboratory. This susceptibility testing is free, compliant with patient testing regulations, and available for all qualifying isolates from any hospital laboratory. The testing is also performed within three working days to quickly assist clinicians with therapeutic management. The pilot program has already begun susceptibility testing with a new drug combination (aztreonam-avibactam) against Enterobacteriaceae producing a metallo-β-lactamase (MβL). These are some of the most resistant microbes, and there are very few effective treatment options. To qualify for this particular testing, isolates must be non-susceptible to all current β-lactam antibiotics (including either ceftazidime-avibactam or meropenem-vaborbactam). Moving forward, the pilot program will expand testing to include other highly resistant microbes and new-to-market antibiotics. So how exactly does the bioprinter pilot program work in practice? Let’s say a hospital patient has symptoms of a serious infection. 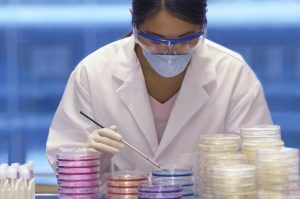 Samples from the patient are tested in the hospital’s laboratory to identify the responsible microbe and to determine possible treatment options. If the microbe is found to be highly resistant and clinicians are in need of additional treatment options, the microbe is sent to one of the four public health laboratories piloting the bioprinter program. Microbiologists there can use the bioprinter to print plates for testing the newest antibiotics to see what, if any, are effective in treating the patient’s infection. Results are then returned to clinicians where the patient is being treated. Implementation of the bioprinter in the AR Lab Network has the potential to be truly impactful. First, clinicians are given a resource to find new, effective treatment options for their patients’ most resistant infections. Second, compiled data from this pilot program can be used to improve antibiotic prescribing, capture national antibiotic efficacy, help establish antibiotic breakpoints and even inform infection control and prevention practices. The bioprinter pilot program is a remarkable step forward in the fight against antibiotic resistance. It is important to realize though that this crisis still requires comprehensive long-term intervention including discovery of new antibiotics, development of new diagnostics, and an unequivocal commitment to antibiotic stewardship in healthcare and beyond. In the short term, though, a printer might just be exactly what the doctor ordered. The post Are antibiotics making printers great…again? appeared first on APHL Lab Blog. How do you suit up? 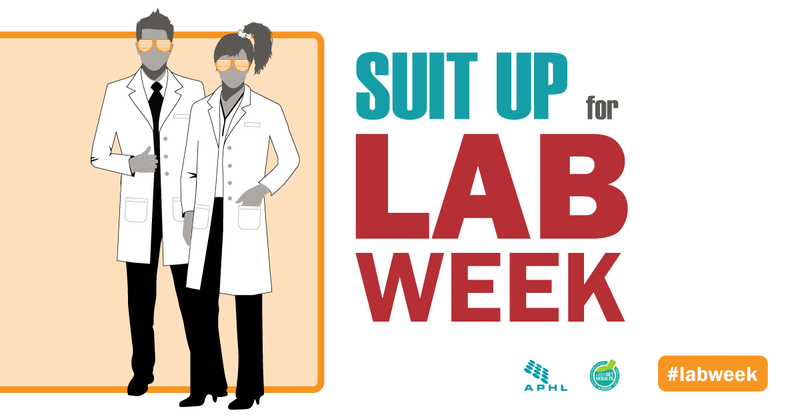 With a crisp white lab coat and purple gloves? Or maybe in a fierce yellow hazmat suit? How about knee-high rubber boots and waders? However you SUIT UP, we want to see it! Take photos or video of you suiting up for Lab Week, and share on Instagram using #SuitUpforLabWeek. 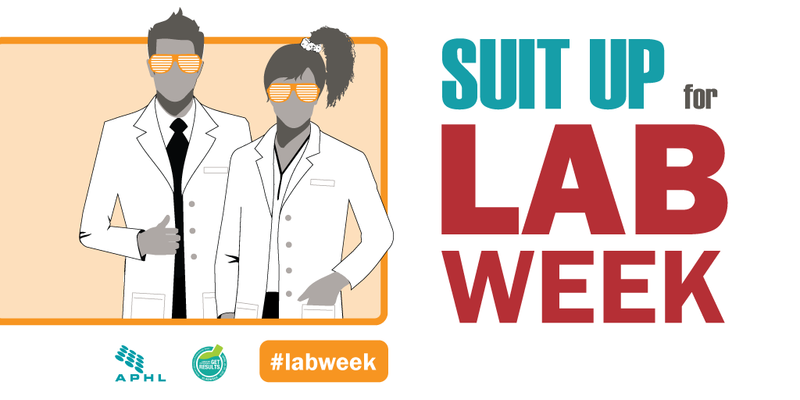 Celebrate Lab Week April 21-27, 2019! What is an emerging infectious disease? What is environmental health testing? 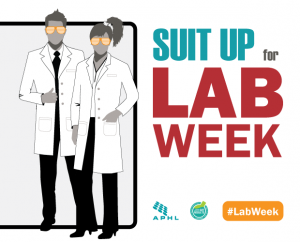 Celebrate Lab Week internally with a social event, banners or other decorations. Print posters, stickers and activity sheets shared below! Hold an open house for media, elected officials, school groups, staff families and other members of the community. Check out the Milwaukee Health Department Laboratory’s story about their health fair for students. Visit local elementary, middle and high schools to talk with students interested in science and health. Write an op-ed piece for local newspapers and/or magazines to highlight the valuable contributions your public health laboratory staff are making in your community, city and/or state. Do you have other ideas? Share them in our Facebook group, APHL Off the Bench, so others can enjoy them too! Host a Green and Blue Day and ask staff to wear colors representing earth and water. Hold a grounds-keeping afternoon: Invite staff and their families to help with weeding, mulch, planting, etc. Ask if your regional EPA office plans to do something for Earth Day and join them as a partner. Encourage employees to do Meatless Monday or purchase items at a local farmer’s market instead of the supermarket. Encourage employees to carpool, take the bus, walk or ride their bike to work. Learn more about the Water Environment Federation (WEF). APHL is part of the Lab Week coalition. 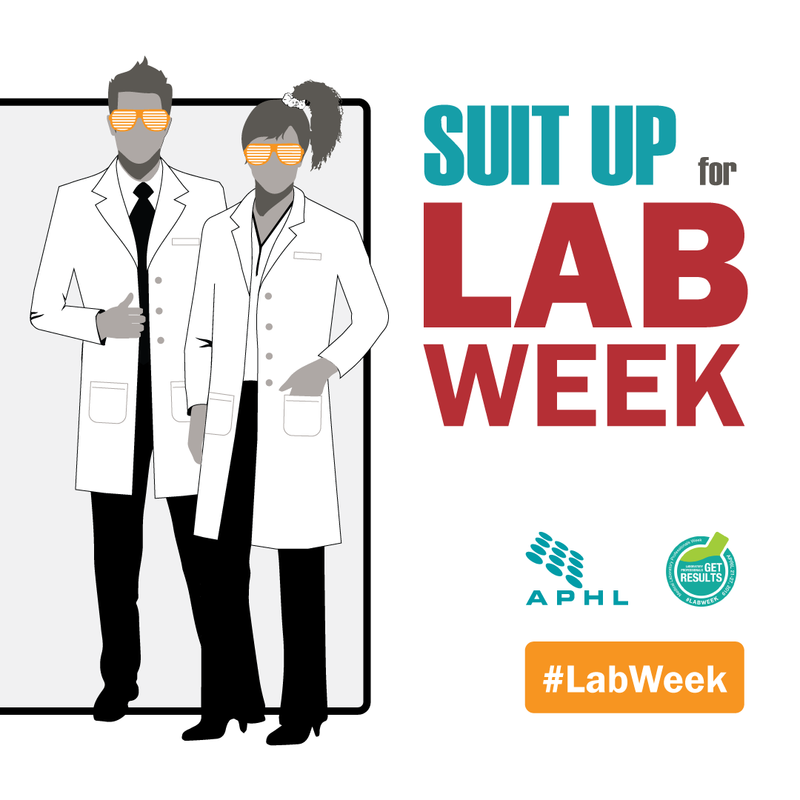 The post SUIT UP for Lab Week — 2019 Lab Week ToolKit appeared first on APHL Lab Blog.